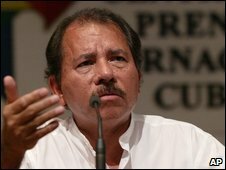 The Nicaraguan Supreme Court has lifted a constitutional ban on re-election, clearing the way for President Daniel Ortega to run again in 2011 elections. The court's decision followed an appeal by Mr Ortega and a group of mayors. In July, Mr Ortega said publically he favoured allowing people the right to seek consecutive terms. The issue of presidential term limits is controversial across Latin America, where several nations have moved to allow consecutive terms in office. The argument in favour is that, in the modern world, continuity over more than four years is needed if effective policies for change are to be enacted. But ending term limits is a divisive subject in a region which saw long-running military dictatorships hold sway for much of the 20th Century. Monday's ruling by the constitutional branch of the Nicaraguan Supreme Court was in response to a petition by Mr Ortega and a group of more than 100 mayors. Six justices, all regarded as supporters of Mr Ortega's Sandinista party, determined that the constitutional ban on allowing re-election was "unenforceable". The electoral court indicated it would accept the ruling. Opposition politicians and jurists condemned the Supreme Court's decision as illegal. Amid celebrations to mark the 30th anniversary of the Sandinista revolution in July, Mr Ortega said that the country should end term limits, as "all should have the right to stand for re-election and be rewarded or punished by the popular vote". At the time, it was thought constitutional change would have to be approved by the National Assembly, where Mr Ortega does not have a majority, or be backed in a public referendum. Mr Ortega first came to power in 1979 after his Sandinista National Liberation Front (FSLN) ousted the dictator Anastasio Somoza. He was elected president in 1984 and served until 1990. Mr Ortega returned to the presidency after winning the 2006 elections. A clause from the 1995 constitution bars presidents from running consecutively or serving more than two terms.